This release marks the 20th anniversary of the Ondine label in 2005. His personal great appreciation for the music of Ravel prompted Reijo Kiilunen to name his company after the first movement of Ravel's piano cycle Gaspard de la nuit, when he started business in 1985. 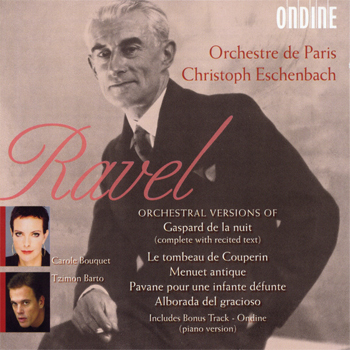 This CD includes the title piece Ondine both in its orchestration by Marius Constant, performed by the Orchestre de Paris under Christoph Eschenbach, as well as in the original piano version, performed by Tzimon Barto. Gaspard de la nuit was written on an inspiration drawn from three poems by Aloysius Bertrand (1807–1841), which are also included on this recording, recited by the great French actress Carole Bouquet.